With his charismatic stage presence, passionate playing and astounding technique, Lang Lang has been hailed by The New York Times as the "hottest artist on the classical music planet". A showman as much as an artist, this superstar pianist has played sold-out concerts in every major city around the globe. 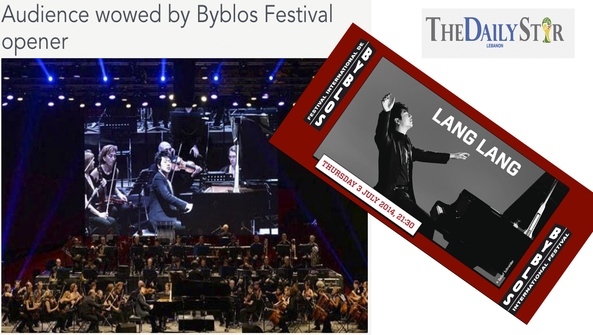 The Chinese piano prodigy opened this year's Byblos International Festival on Thursday evening accompanied by the Lebanese Philharmonic Orchestra conducted by Maestro Darrell Ang, as this was his first concert in Lebanon and undoubtedly a historical date for music lovers!. LL amazed the Lebanese audience with his interpretations of Rachmaninov's concerto no. 2 and Chopin's masterpieces among other compositions.